token. What did the “M” stand for? Seated Liberty quarter dated 1854. 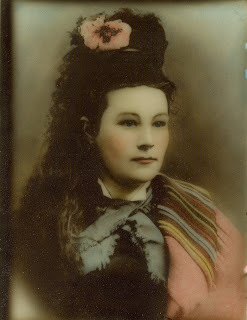 Some years ago, my second cousin, Benita Jane (McCormick) Olson, gave me a small brooch that had belonged to my great-grandmother, Mary Jane (Gaffney) McGinnis. 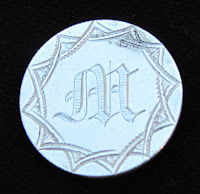 The brooch had been made from an old coin that was planed on one side, where someone had etched the letter “M” and bordered it with an embellishment of double linked curves. On the reverse, they had soldered a hinge, through which they had threaded a gold nail that tucked under a C-shaped catch. 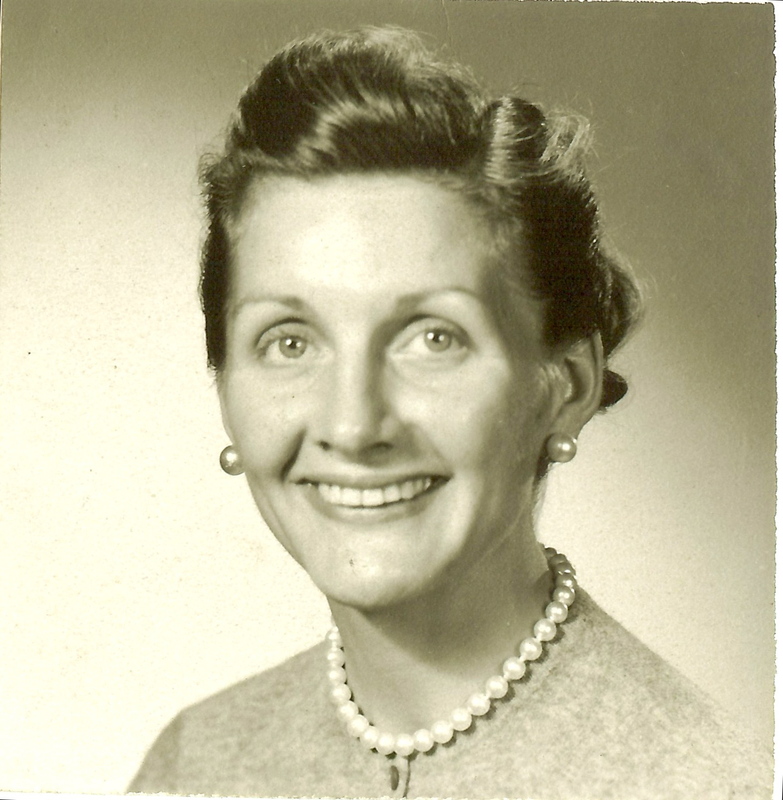 My late cousin, who I knew as Jane and was named for her mother and grandmother – Benita McGinnis and Mary Jane Gaffney – had received the brooch from her mother. All she knew about it was that it had belonged to her grandmother. Neither of us had ever seen anything like it before, and our questions were many. Who made it, and why? Did the “M” stand for Mary Jane’s name? Did it stand for “Mother”? Had it been a gift from one of her four children? Or did it stand for her married name, McGinnis, and did it come from her husband, Tom? Although love tokens can take many forms and date back to Roman times, the practice of engraving a symbol of one’s love began in Wales in the 15th century, when young men carved intricate designs on spoons as tokens of their love and affection for their intended. The tradition expanded to include coins in 17th century England and reached the height of their popularity in the United States during the Civil War. Sailors also made them for their sweethearts as a promise of their return. Until the early 20th century, all were made by hand. The practice continued through World War I, when soldiers made them for their mothers and girlfriends, sometimes by hand, but mostly with machinery. Love tokens were often substituted for engagement rings, understandably so as a young lady would likely wear the brooch near her heart. The coins either had holes punched through the top to wear on a chain, or they had hinges attached with thin bent nails to wear as a brooch. Typically, they bore the initial of the beloved, but they also could be quite ornate. Some love tokens were engraved with names, messages or symbols and other embellishments. Most love tokens were made from Seated Liberty dimes or nickels. The dimes, in particular, were the easiest to plane and engrave because of the softness of the silver. The dimes and nickels were the most popular denominations to use, as they were less costly than quarters and dollars. Still, these factors could not diminish the love shared by the giver and the recipient of such a heartfelt gift. So who gave our Mary Jane her love token, and why? The more expensive denomination of the Seated Liberty quarter suggests that it might have been more affordable for a young man to give his beloved than as a gift from a boy or girl for their mother. The year under the hinge is 1854; could that be of any significance? It would be less likely for one of the children to possess a coin from that date. Could 1854 have alluded to Thomas McGinnis’ year of birth? I have been unable to find his birth certificate. His death certificate notes he was born in 1855. 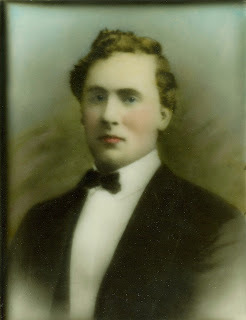 Various census records put his birth between 1855 and 1858, so it is hard to tell for sure. Then again, maybe the date held no particular significance at all. Thomas had run away to sea as a boy, so he could have learned how to carve love tokens as a sailor. If in fact he was the giver, as I suspect, the “M” could have stood for Mary Jane. The romantic in me thinks it also could have stood for McGinnis, which would become Mary Jane’s new last name – and in a single initial would have signified both of them coming together as one. So maybe it was a symbol of their engagement. I treasure this lovely and very sentimental brooch. It is something both of my great-grandparents touched lovingly. I marvel that something so small has endured through four generations – from Mary Jane to her daughter, Benita, to her granddaughter, Jane, and now to me. It symbolizes so much love between husband and wife, mother and child, and beyond. I am very grateful to Jane for her special gift, and I look forward to passing it on to my own daughter, Erin, one day. I wear Mary Jane’s brooch on special occasions, Mother’s Day being one of them. I will wear it today, in honor of her marriage to Thomas on this day, May 19th, some 128 years ago. I also will wear it tomorrow to remember my dear cousin Jane Olson, on her birthday. As small packages go, this is the best kind: the gift that keeps on giving. What a treasure, Linda! Interesting history of the love tokens, too. I hope you find the answer about the significance of "M" and "1854."